the universe gave me… royal pickles. yesterday i received one of those perfect gifts of the universe, that…. (if i was having any thoughts along the lines of: “am i doing what i am supposed to be doing?” or “aaaam i where i am supposed to be / needed?”) were demolished. 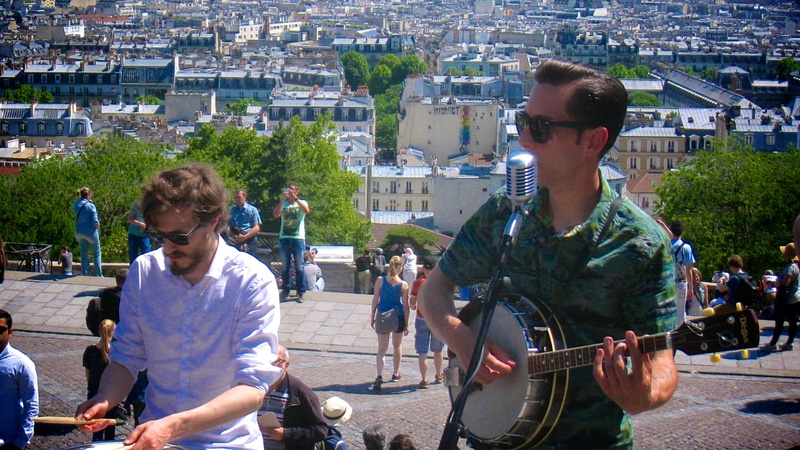 i went sacré-cœur (one of my favorite spots in paris) and i knew, walking up the stairs, in the beaming sun, that it would be worth the view from the tippy-top . when i got close to the last stairs, i heard lovely music paying. i sat on a step in front of the band, consisting of seven beauties, as they were playing “i ain’t got nobody nobooohohohody” (“just a gigolo” – louis prima) and when the sax-solo came up…. so did the tears in my eyes. the moment was just magical…. everyone was enchanted….strangers started dancing with each-other…. a feeling you can’t buy there was no way that i was not supposed to be exactly there at exactly that moment. the universe has gifts like this for everyone… everyday. all you have to do is see them and cherish them. when i was talking to one of the singers, as i was buying a cd, i told her: “i wish i had some sunscreen for you!” (le solei was coming down stoooong) a guy next to me heard it and while saying “i am australian!” he pulled out a bottle for the whole band to use. that the universe for ya.